Oris’ track record in producing limited edition watches is almost as distinguished as the track record of the man to whom Oris dedicates its latest jazz watch: Oscar Peterson. Regarded by many as the greatest jazz pianist of all time, his career and chosen instrument inspired the special design features of this elegant watch. The delicately applied indices take the form of piano keys and sit atop a central dial ring with concentric grooves. This dial ring is reminiscent of an LP and refers to the hundreds of recordings Oscar Peterson made during his career. Oscar Peterson loved watches with Roman numerals and this limited edition honours that – even displaying the VIII in gold plate – a reference to the eight Grammys he won during his lifetime. 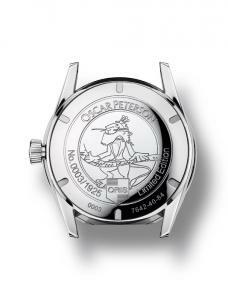 The case back carries the Oscar Peterson lion logo and the limited edition number from 0001/1925 to 1925/1925, chosen because it was the year the great man was born. 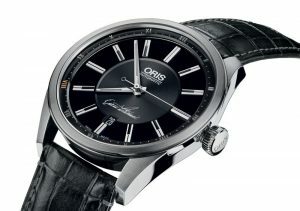 Oscar Peterson’s talent knew no bounds: the Oris Oscar Peterson Limited Edition is a fitting tribute to a jazz giant. – Automatic mechanical movement. Centralised second, minute and hour displays. Date display at 6 o’clock. – Multi-piece stainless steel case with stainless steel crown. Water resistant to 10 bar/100m. – Sapphire glass domed on both sides with inner anti-reflective coating. – Black dial with applied ‘piano key’ indices. – Black dial with applied Roman numerals. VIII plated in rose gold plated. – Nickel hands with Superluminova inlay. Second hand with ‘O’ counterbalance. – Black calf skin leather strap with croco imprint and stainless steel folding clasp. – Varnished wooden box, certificate and DVD. 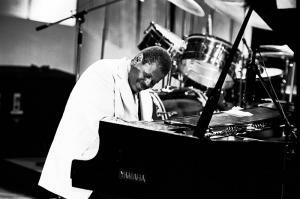 Oscar Emmanuel Peterson, (August 15, 1925 – December 23, 2007) was a Canadian jazz pianist and composer. He was called the “Maharaja of the keyboard” by Duke Ellington, “O.P.” by his friends, and was a member of jazz royalty. He released over 200 recordings, won seven Grammy Awards, and received other numerous awards and honours over the course of his career. He is considered to have been one of the greatest jazz pianists of all time, who played thousands of live concerts to audiences worldwide in a career lasting more than 65 years.